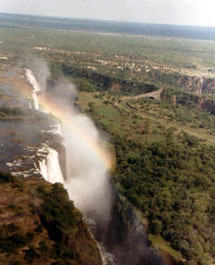 Zimbabwe is landlocked; the Zambezi forms a natural riverine boundary with Zambia; in full flood (February-April) the massive Victoria Falls on the river forms the world's largest curtain of falling water. Location: Borders Zambia, Mozambique,Botswana, South Africa and Namibia. Terrain: Mostly high plateau with higher central plateau (high veld), mountains in east.